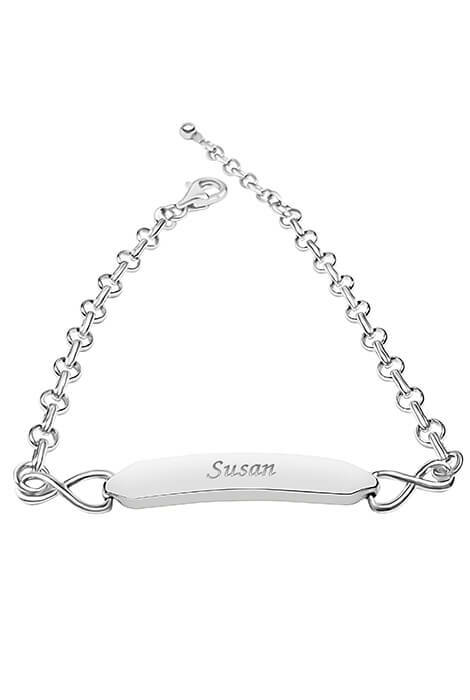 Sterling silver bracelet artfully includes an infinity link on each side of its sleek name plate. This sleek, stylish bracelet can be personalized, making it a beautiful gift for someone special or to wear in remembrance of someone you'll love forever. Specify name: 1 line, up to 9 letters/spaces, upper/lower case. 8" long bracelet with lobster clasp includes a 1" long extender. 100% sterling silver. Allow 4–6 weeks for delivery.